Norin the Wary can gain hilarious amounts of life with Soul's Attendant or Soul Warden . 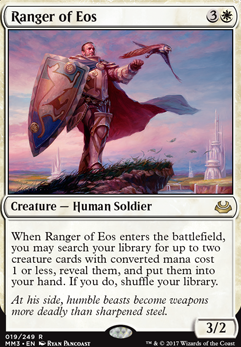 Ranger of Eos can tutor out Norin, so you don't need to have all four in your deck. With all those ETB effects, Eternal Witness and Eerie Interlude could generate a lot of value. @SynergyBuild I think we're discussing semantics now. I should have made a distinction between top tier power cards, and cards that are very good (and maybe even cheap vs expensive $ in that regard). After all we have Chalice of the Void , Gaddock Teeg and Ranger of Eos . 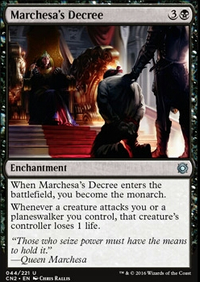 I'd argue the cards in question don't exceed the power level of Modern and I do think we will get good cards, just not the iconic powerhouse, format definig Legacy cards ( Wasteland Strip Mine Force of Will Karakas ). I'd also argue that on this specific matter, WOTC do care... heck they employed people to actually playtest Modern, and I also think they want to keep a clear distinction between Legacy and Modern. Is it me or are you a bit low on the lifegain side? I do like your take on trying to control the board through other cards than Karlov. But I feel, when looking at this list, you might have problems getting Karlov going consistently. I mean no tutors: Demonic Tutor , Vampiric Tutor , Ranger of Eos etc. Also have you reconsidered Contemplation ? it does the same as the Demon's Horn but better. It is erratad to "Whenever you cast a spell"
Also: Auriok Champion , Blood Artist , Mother of Runes , Sword of Light and Shadow ? In my opinion auto includes to any Karlov deck. When it comes to lifegain triggers, I play about 25 in my deck, wich often result in a 8/8 Karlov by turn 3. What's mostly is important is to generate as much lifegain triggers as possible. Karlov does not really care for big lifegain triggers. Right now you play a lot of equipments and thats logical since you want to go Voltron. But generally speaking you don't need as much as you run right now. 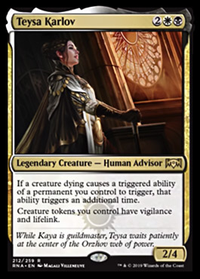 I would play much more lifegain triggers, since that helps with your life total + Karlov will grow insanely big in a very short time. 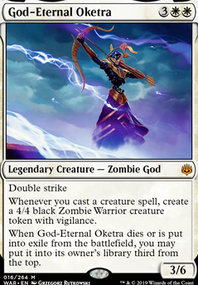 That being said being able to give Karlov protection from a color is really good like Mother of Runes . So I would try a Eight-and-a-Half-Tails for example. 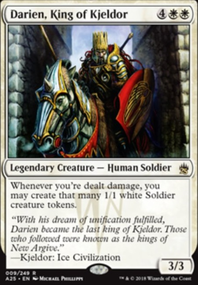 Since he also protects your permanents (all of em) and he can make lands white, so he also deals with for example Maze of Ith . Another auto include is Kambal, Consul of Allocation . 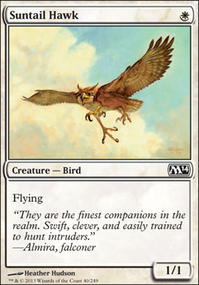 And things like Crypt Ghast , Tymna the Weaver , Suture Priest , Ranger of Eos . Also what really works for me is things that trigger on cast. Overal things that only trigger in your upkeep are waaaaaay to slow and will only provide one trigger. Cards like Tablet of the Guilds , Contemplation . Out: Angelic Destiny , Open the Armory , Plains . In: Ranger of Eos , Soul Warden , Soul's Attendant .